Okay, I just had to share this with you. Remember last week, when I asked if anyone has any suggestions on what to eat/do in Montreal? Cidell urged me try poutine, a “wonderful disgusting diet breaking bowl of french fries, gravy and cheese curds”. Sounds good to me! That was the first time I had ever heard of the dish. Well… yesterday, the NY Times published an article on this Quebecois delicacy, which got me even more excited to try it. They mentioned a website, montrealpoutine.com, that is a great reference, especially their list of 24 hour poutine joints. 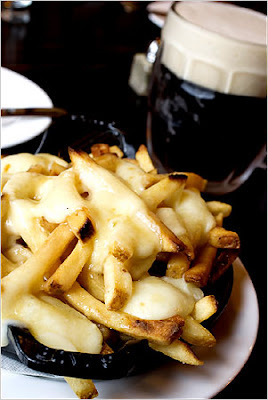 Then… this morning, I’m browsing the Seattlest site, when I see yet another mention of poutine! It’s written in response to the NY Times article, and they say that Aussies are also fond of poutine, so an Australian chef at a local restaurant has got it on the menu. So after all this poutine hype, I am dying to have some! 'kay, that second journo was clearly on drugs. I'm Australian and I have NEVER heard of or seen anything that resembles poutin in my life. Logically, given our history, there's little French influence on our food. More Mediterranean/ Asian as a rule. Though chips'n'gravy is relatively common (a staple at my uni ref). Though that thing does sound good. For years I have tried to get people to eat this and they make faces. I feel so validated now! You know I like it so much that every winter (the only time they will ship) I order two pounds of curds from Wisconsin. I am so excited for you! Disco fries - love it. That sounds like the perfect 3am food indeed.